When you start moving scenes and panels around, the Rename Scene dialog box automatically opens and prompts you to rename them every time. 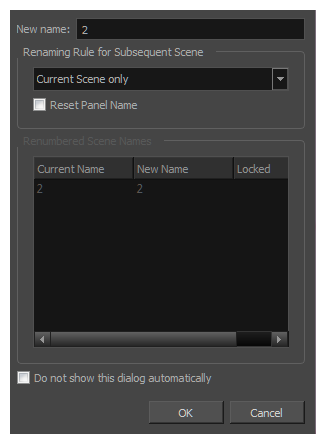 You can also rename selected scenes as needed, using the Rename Scene command or the Panel view. 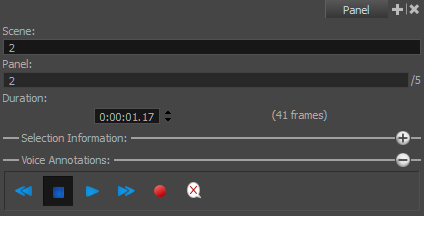 Use the Renaming Rule for Subsequent Scene menu and determine if the next scenes should be renamed. The Renumbered Scene Names section displays the current and new names for all the scenes that will be affected by the renaming process. Current Scene Only:Renames only the selected scene. Renumber Scenes:Renumbers the current scene, as well as all the scenes that follow. Renumber Selected Scenes: Renumbers the first selected scene of a multiselection, as well as all the following scenes that are part of the selection. Renumber Prefix Only: Renumbers the scenes' numerical prefixes beginning at the selected scene. The new name must be a numerical value. Select the Reset Panel Name option to reset all panel names according to the current panel time automatic increment rule. Select the Do not show this dialog automatically option to prevent it from automatically opening every time you move scenes around. Press Enter to validate the scene name or number. If the name is invalid or already used by another scene, a warning message will appear. If this happens, use the Rename command to rename all subsequent scenes.